I went to visit Mom the other day, and came home with swiss chard and beets! I had just mentioned in another post that Brian likes borsht, so I was really happy to get some beets. They were small, but would be enough for one meal. It was already close to supper time, so I decided to just make the greens, and leave the borscht for another day. 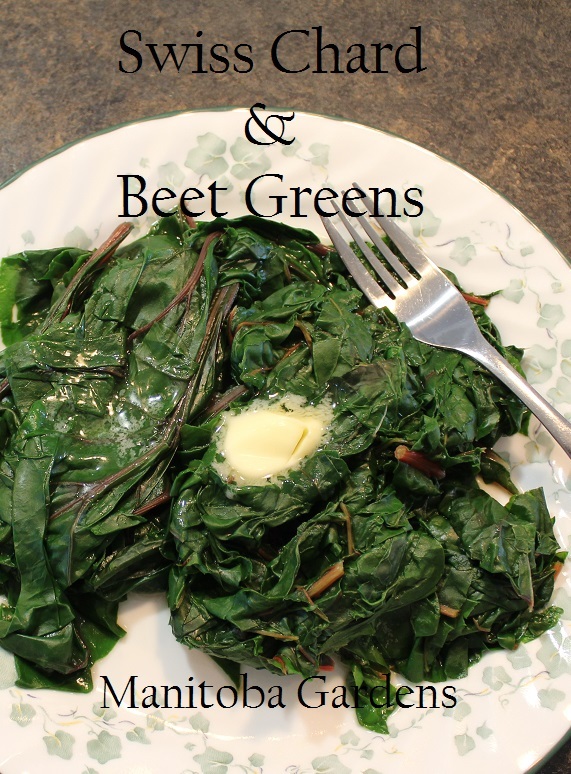 There are lots of recipes for how to prepare greens....you can add sauteed onions, garlic, even bacon.... but I keep it plain and simple. I washed both, then cut off the beets and the swiss chard stalks. I also removed the center of each swiss chard leaf. I cut the swiss chard in strips. The beet leaves were small, so I left them whole. then put in the greens. Both take about 3 minutes. Just add butter, and serve. There's not a lot of difference in flavour; the swiss chard is slightly milder. Both are as tasty as they are healthy! Yup, they were very yummy!